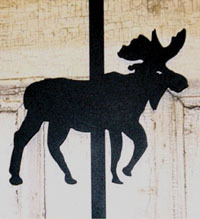 The Moose Wreath Holder is a favorite design to adorn any door and wreath anytime, year around. The hanger is in a textured black powder coating and will endure indoor and outdoor weather. This piece is an excellent design for the home, camp or cottage!